As I approach my 1000th day of living in Denmark, I have begun to think about the "lessons" I have learned in my time here---Some of those lessons are things that I read about/heard about before I arrived and then saw "in real life" after I got here. Others are lessons that I thought I knew, but come to find out, I was 100% wrong about. And still others are those little surprises that I never expected to embody a "lesson" within them! This cute little umbrella that I bought at the GAP for $10 is just that.... a CUTE little umbrella. It fits nicely in my purse or backpack and is so cheery and happy with its colors! 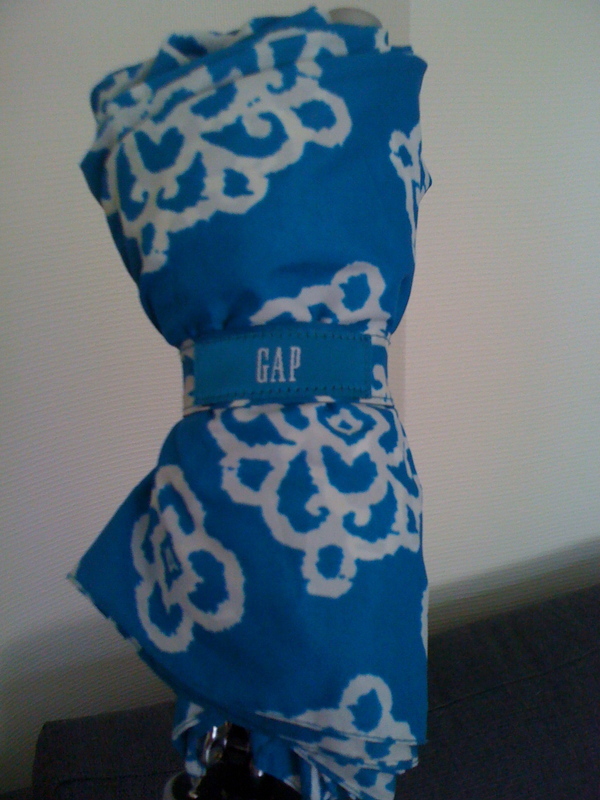 HOWEVER, cute little $10 umbrellas from the GAP are not made for the rainy days in Denmark! This poor little guy has been turned inside out more times than I care to remember and many of his little "arms" have snapped in two. "Hey I should get one of those cute purse-sized umbrellas before I move because I heard you should always have an umbrella on you in DK because the rain just comes at the most random times." "The Land of the SIDEWAYS Rain." I'm serious. Just wait.... You'll see! Wind and rain, my mother learned that lessons as well, after she was dragged halfway out in a muddy field, clutching her cute umbrella. Umbrellas are mostly useless here. Second, have experienced sideways rain when we lived on the coast of Norway...NOT good...don't like that kind of rain...for that you need a whole rain suit that covers the whole body, not just a cover over the top..have you bought rain clothing yet?? I hear you! Can't use umbrellas here either in the October gales. I recently saw that you can buy wind-proof umbrellas. I was just saying that quote from Forest Gump (when he's in the Vietnam War)about rain to my husband since it's been raining nonstop here in DK. Forest Gump says "One day it started raining, and it didn't quit for four months. We been through every kind of rain there is. Little bitty stingin' rain... and big ol' fat rain. Rain that flew in sideways. And sometimes rain even seemed to come straight up from underneath." I thought that all my California umbrellas were designed as accessories and not meant to really be used! Yep... it's easier to just RUN!!!! I started to feel more "Danish" the day I went out with my ugly rain gear and didn't feel too ashamed about the way I looked in it... and arrived nearly dry at work...! Seriously.... the same exact thing happened to me in Belgium last year. Had been using my pathetic-but-cute bumblebee gap umbrella for quite a while, even though it turned inside out about a hundred times... one day I just threw it in the trash because, really, it wasn't doing anything an umbrella was meant to do.